A genetically modified mouse in which a gene affecting hair growth has been knocked out (left), shown next to a normal lab mouse. A genetically modified mouse (Mus musculus) is a mouse that has had its genome altered through the use of genetic engineering techniques. Genetically modified mice are commonly used for research or as animal models of human diseases, and are also used for research on genes. In 1974 Beatrice Mintz and Rudolf Jaenisch created the first genetically modified animal by inserting a DNA virus into an early-stage mouse embryo and showing that the inserted genes were present in every cell. However, the mice did not pass the transgene to their offspring, and the impact and applicability of this experiment were, therefore, limited. In 1981 the laboratories of Frank Ruddle from Yale University, Frank Costantini and Elizabeth Lacy from Oxford, and Ralph Brinster and Richard Palmiter in collaboration from the University of Pennsylvania and the University of Washington injected purified DNA into a single-cell mouse embryo utilizing techniques developed by Brinster in the 1960s and 1970s, showing transmission of the genetic material to subsequent generations for the first time. During the early eighties, Palmiter and Brinster developed and led the field of transgenesis, refining methods of germline modification and using these techniques to elucidate the activity and function of genes in a way never possible before their unique approach. There are two basic technical approaches to produce genetically modified mice. The first involves pronuclear injection into a single cell of the mouse embryo, where it will randomly integrate into the mouse genome. This method creates a transgenic mouse and is used to insert new genetic information into the mouse genome or to over-express endogenous genes. The second approach, pioneered by Oliver Smithies and Mario Capecchi, involves modifying embryonic stem cells with a DNA construct containing DNA sequences homologous to the target gene. Embryonic stem cells that recombine with the genomic DNA are selected for and they are then injected into the mice blastocysts. This method is used to manipulate a single gene, in most cases "knocking out" the target gene, although more subtle genetic manipulation can occur (e.g. only changing single nucleotides). 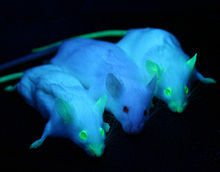 Transgenic mice expressing green fluorescent protein, which glows green under blue light. The central mouse is wild-type. Genetically modified mice are used extensively in research as models of human disease. Mice are a useful model for genetic manipulation and research, as their tissues and organs are similar to that of a human and they carry virtually all the same genes that operate in humans. They also have advantages over other mammals, in regards to research, in that they are available in hundreds of genetically homogeneous strains. Also, due to their size, they can be kept and housed in large numbers, reducing the cost of research and experiments. The most common type is the knockout mouse, where the activity of a single (or in some cases multiple) genes are removed. They have been used to study and model obesity, heart disease, diabetes, arthritis, substance abuse, anxiety, aging and Parkinson disease. Transgenic mice generated to carry cloned oncogenes and knockout mice lacking tumor suppressing genes have provided good models for human cancer. Hundreds of these oncomice have been developed covering a wide range of cancers affecting most organs of the body and they are being refined to become more representative of human cancer. The disease symptoms and potential drugs or treatments can be tested against these mouse models. A mouse has been genetically engineered to have increased muscle growth and strength by overexpressing the insulin-like growth factor I (IGF-I) in differentiated muscle fibers. Another mouse has had a gene altered that is involved in glucose metabolism and runs faster, lives longer, is more sexually active and eats more without getting fatter than the average mouse (see Metabolic supermice). Great care should be taken when deciding how to use genetically modified mice in research. Even basic issues like choosing the correct "wild-type" control mouse to use for comparison are sometimes overlooked. ^ Jaenisch, R.; Mintz, B. (1974). "Simian virus 40 DNA sequences in DNA of healthy adult mice derived from preimplantation blastocysts injected with viral DNA". Proc. Natl. Acad. Sci. 71 (4): 1250–1254. Bibcode:1974PNAS...71.1250J. doi:10.1073/pnas.71.4.1250. PMC 388203. PMID 4364530. ^ Kucherlapati, Raju; Leinwand, Leslie A. (2013). "Frank Ruddle (1929–2013". American Journal of Human Genetics. 92 (6): 839–840. doi:10.1016/j.ajhg.2013.05.012. PMC 3675234. PMID 24242788. ^ Gordon, J.; Ruddle, F. (1981). "Integration and stable germ line transmission of genes injected into mouse pronuclei". Science. 214 (4526): 1244–6. Bibcode:1981Sci...214.1244G. doi:10.1126/science.6272397. PMID 6272397. ^ Costantini, F.; Lacy, E. (1981). "Introduction of a rabbit β-globin gene into the mouse germ line". Nature. 294 (5836): 92–4. Bibcode:1981Natur.294...92C. doi:10.1038/294092a0. PMID 6945481. ^ Brinster R, Chen HY, Trumbauer M, Senear AW, Warren R, Palmiter RD (1981). "Somatic expression of herpes thymidine kinase in mice following injection of a fusion gene into eggs". Cell. 27 (1 Pt 2): 223–231. doi:10.1016/0092-8674(81)90376-7. PMC 4883678. PMID 6276022. ^ a b Douglas Hanahan; Erwin F. Wagner; Richard D. Palmiter (2007). "The origins of oncomice: a history of the first transgenic mice genetically engineered to develop cancer". Genes Dev. 21 (18): 2258–2270. doi:10.1101/gad.1583307. PMID 17875663. ^ Thomas KR, Capecchi MR (1987). "Site-directed mutagenesis by gene targeting in mouse embryo-derived stem cells". Cell. 51 (3): 503–12. doi:10.1016/0092-8674(87)90646-5. PMID 2822260. ^ "Background: Cloned and Genetically Modified Animals". Center for Genetics and Society. April 14, 2005. ^ a b c Hofker, Marten H.; Deursen, Jan van (2002). Transgenic Mouse. Totowa, New Jersey: Humana Press. p. 1. ISBN 0-89603-915-3. ^ "Knockout Mice". Nation Human Genome Research Institute. 2009. ^ McPherron, A.; Lawler, A.; Lee, S. (1997). "Regulation of skeletal muscle mass in mice by a new TGF-beta superfamily member". Nature. 387 (6628): 83–90. Bibcode:1997Natur.387...83M. doi:10.1038/387083a0. PMID 9139826. ^ Elisabeth R. Barton-Davis; Daria I. Shoturma; Antonio Musaro; Nadia Rosenthal; H. Lee Sweeney (1998). "Viral mediated expression of insulin-like growth factor I blocks the aging-related loss of skeletal muscle function". PNAS. 95 (26): 15603–15607. Bibcode:1998PNAS...9515603B. doi:10.1073/pnas.95.26.15603. PMC 28090. PMID 9861016. ^ "Genetically engineered super mouse stuns scientists". AAP. November 3, 2007. ^ Hakimi P, Yang J, Casadesus G, Massillon D, Tolentino-Silva F, Nye C, Cabrera M, Hagen D, Utter C, Baghdy Y, Johnson DH, Wilson DL, Kirwan JP, Kalhan SC, Hanson RW (2007). "Overexpression of the cytosolic form of phosphoenolpyruvate carboxykinase (GTP) in skeletal muscle repatterns energy metabolism in the mouse". Journal of Biological Chemistry. 282 (45): 32844–32855. doi:10.1074/jbc.M706127200. PMC 4484620. PMID 17716967. ^ Crusio, WE; Goldowitz, D.; Holmes, A.; Wolfer, D. (2009). "Standards for the publication of mouse mutant studies". Genes, Brain and Behavior. 8 (1): 1–4. doi:10.1111/j.1601-183X.2008.00438.x. PMID 18778401. ^ Mohammed Bourdi; John S. Davies; Lance R. Pohl (2011). "Mispairing C57BL/6 Substrains of Genetically Engineered Mice and Wild-Type Controls Can Lead to Confounding Results as It Did in Studies of JNK2 in Acetaminophen and Concanavalin A Liver Injury". Chemical Research in Toxicology. 24 (6): 794–796. doi:10.1021/tx200143x. PMC 3157912. PMID 21557537. This page was last edited on 26 March 2019, at 00:44 (UTC).